This week’s must-read books and apps from the world of digital comics in the Sunday Digest, include Mono from Madefire, Quantum and Woody from Valiant Comics and Archaeologists of Shadows from Septagon Studios. If our exclusive preview from earlier this week has whetted your appetite for more Mono, then you really should be checking out the latest installment from Liam Sharp and Ben Wolstenholme’s on the Madefire app. It’s a slow burner this episode, compared to the action of issue 3, as evil Nazi General Eberhard attempts to woo his aristocratic French captive in a chateau full of treasures only to be interrupted by our hero. (Is this the titular Old Curiosity Shop?) Its got an almost Tarantino-esque feel, reminiscent of the best scenes from Inglorious Basterds, with a tense, dialogue heavy story and a real standout scene featuring a 3 x 3 panel that assembles itself from individual panels. It’s a fantastic addition to the already stunning Mono back catalogue and another awesome example of what the guys at Madefire are up to with digital comics. At a time when everyone is looking to be post-modern and overly analytical about superheroes, it’s refreshing to read a book that does this with a generous dose of stupidity and humour. Dubbed the Worlds Worst Superteam, this is another Valiant dust-off as writer James Asmus and artist Tom Fowler bring back the not-so-dynamic duo from publishing oblivion and gives us a fantastic dose of bickering super powered siblings. Eric and Woody Henderson are the duo in questions and when their father dies in mysterious circumstances this squabbling pair uncover more than they bargained for when looking into his mysterious lab. This first issue is classic origin stuff but there’s enough bickering banter and slapstick action to give you the idea that series is going to be a lot of fun every month and sure as hell won’t be taking itself too seriously. Plus there’s going to be a goat! The truly stunning Archaeologists of Shadows is a digital graphic novel from writer Lara Fuentes and artist Patricio Clarey. Keen to have their voice heard outside of their native Spain, this pair of intrepid comic creators joined forces with Sepatagon Studios to produce one of the most beautifully realised books you will see this year. Featuring stunning artwork that mixes digital painting, cutting edge computer graphics and 3D models, it has a haunting ethereal quality with every page a work of art. The slightly meandering story of a futuristic world where the organic human form is slowly being forced to convert into a mechanical construct and the Authorities punish those who resist the transformation is a little bit overwraught at times, but there is no denying this is a truly epic book to look at. 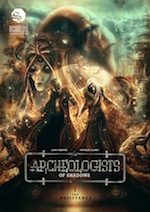 Archaeologists of Shadows is available from Comics Plus, Amazon, Apple’s iBooks Store, DriveThru Comics and My Digital Comics for the bargain price of $0.99 for over 100 pages! 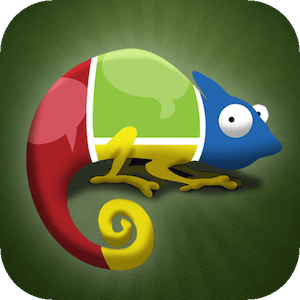 Comic Chamelon is the one stop app for web comics on your iPhone. Featuring 29 fantasic series including Ryan North’s Dinosaur Comics, Bernie How’s Alien Loves Predator and Sam Logan’s Sam and Fuzzy, alongside a host of other great titles, Comic Chameleon gives you all your webcomic needs in one place. Each series features a complete archive, is viewable via a panel by panel view and has the full support of the artists involved and so is constantly updated. An absolute must for anyone who needs a daily does of digital comics on their smartphone.